CARA's staff includes those working on-site at our offices in Glover Park, Washington, DC, as well as those working off-site in the United States and elsewhere. Our staff is interdisciplinary. We have the combined skills, knowledge, and experience to conduct any type of social science research and consulting for our clients. 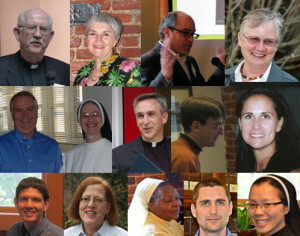 On-site staff with doctorates are faculty members at Georgetown University. Rev. Thomas P. Gaunt, SJ, Ph.D.
CARA Executive Director. Has a Ph.D. in City Planning with experience as a Pastor and Diocesan Director of Planning and Research. Editor of The CARA Report, Senior Research Associate. Has a Ph.D. in Sociology. Communications and Development. Has a B.S. in Business and Marketing. Director of CARA Catholic Polls (CCP), Senior Research Associate. Has a Ph.D. in Political Science. Research Associate. Has a Ph.D. in Philanthropic Studies. Research Assistant. Has a B.A. in Communications. Director of CARA Parish Surveys. Has a Ph.D. in Sociology. Sr. Thu T. Do, LHC, Ph.D.
CARA Research Associate. Has a Ph.D. in Higher Education. Sr. Hellen Bandiho, STH, has a E.D. in Education. Sr. Mary E. Bendyna, OP has a Ph.D. in Government. Sr. Joan Chisala, B.ED. in Education. Sr. Florence Emurayeveya, EHJ has a M.A. in Education. Rev. Stephen Joseph Fichter has a Ph.D. in Sociology with experience as a Pastor. Mary Ellen Fise has a J.D. and an M.A. in Church Ministry. Prakit Hirankarn has an M.B.A.
Jonathon C. Holland has an M.A. in Sociology and is working on his Ph.D.
C. Joseph O’Hara has a Ph.D. in Sociology. Sr. Bibiana M. Ngundo, LSOSF has a Ph.D. in Religious Studies. Paul M. Perl has a Ph.D. in Sociology. Sr. Patricia Wittberg, SC has a Ph.D. in Sociology.